This was originally released on Creation Records in 1987 on 12" and has become one of the most collectable releases on that label, with copies exchanging hands for over £100. 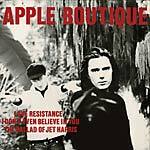 Making it's first appearance on 7" the Love Resistance EP is an outstanding example of late 1980s jangle pop. Showcasing the guitar interplay of former Phil King (The Servants, Biff Bang Pow, Felt, Lush, Jesus And Mary Chain) and John Mohan (The Servants, Felt) with a heavy influence from the 1960s. This was Apple Boutique's only release. Splatter vinyl; Includes postcard and poster; Edition of 500.